Carbon fibre is a material rarely used in sunglasses, but as ever Oakley push the boundaries of design and have mastered its use to bring you the Oakley Tinfoil Carbon. 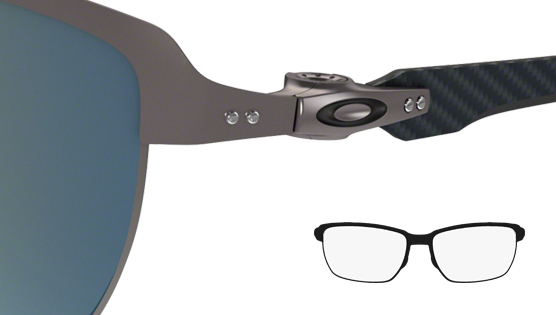 Tinfoil Carbon from Oakley is a half rim sunglass that forms part of their Hollowpoint collection of mens glasses. Oakley have been clever with sculpturing of the bridge area, it thins out as it heads from the top to the bottom. Pretty neat really and gives a nice contrast to its full framed brother the Tincan. A great design feature of the Tinfoil (and Tincan) is the screwless hinge system in place, which means no more lost screws! Its a crazy bit of engineering to produce a tiny hubless hinge system that runs so smooth. Carbon fibre is a material rarely used in sunglasses, but as ever Oakley push the boundaries of design comfort and have mastered its use. Adapting their manufacturing process with it and finally producing some flexible, lightweight and super stylish models.